Inner Wellness Studio invites you to fully embrace yoga as a technology for holistic living. This course is a comprehensive study and practice of yoga. It will give you a profound experience of yoga that will transform your body and mind. On completion of the course you will be qualified and certified to teach yoga. Your teaching credentials will be recognised internationally with Yoga Alliance. 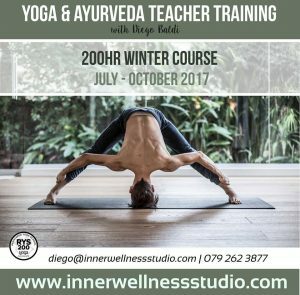 You can contact Diego, the founder of Inner Wellness Studio, directly at diego@innerwellnessstudio.com or 079 262 3877.